In November 2017 the RE Committee applied for a grant offered by First Parish Church United which fit the Church and Outreach theme “Who is MY Neighbor and How Can I/we help? 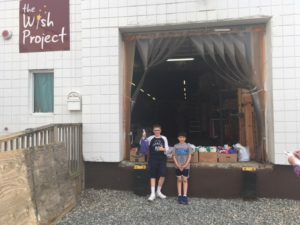 We learned about an opportunity to support a program run by the Lowell Wish called ‘B.I.T.s Bags (Basic Items for Toddlers) whose mission spoke to us. In this program social workers who visit families in need carry bags filled with age appropriate items for toddlers: board books, bubbles, rubber duckies, stacking toys, etc. so that they may offer these essential, yet basic items which encourage play, fine motor skill development, language development, understanding of cause and effect, the list goes on! Our students in the RE program range in age from toddler to high school and are exposed to a variety of developmentally appropriate activities and experiences. The idea and concept of Neighbor is an important one to the RE program and building an understanding of ‘neighbor’ is part of the K-2 curriculum. By learning about and supporting other children, just like themselves, who are our ‘neighbors’ even our youngest RE students will be able to make a connection to the mission of helping other ‘little kids’ have access to the ‘fun’ toys they themselves had access to as little tikes. Through the generosity of our church awarding us with a grant for $400, along with donations from members of our church and our community, and the collection of coins as RE children ‘filled their buckets’ at home, we were able to fill 50 bags to go towards the Lowell Wish’s goal of 500, that’s 10%! Each colorful bag held 8 items: board book, coloring book, ‘big’ crayons, sidewalk chalk, bubbles, inflatable beach ball, rubber ducky, and a brand new interactive toy (ie stacking rings). These bags were assembled by the children on a Sunday in April and delivered to the Lowell Wish by our RE Director, Nicki Tracey, and RE Committee Chair, Jennifer Scarano, along with her two sons, Nicholas and Julian. We are all very proud of our community and the outreach we were able to do to help our neighbors.